Talmudist and popular preacher; died .after 1662. 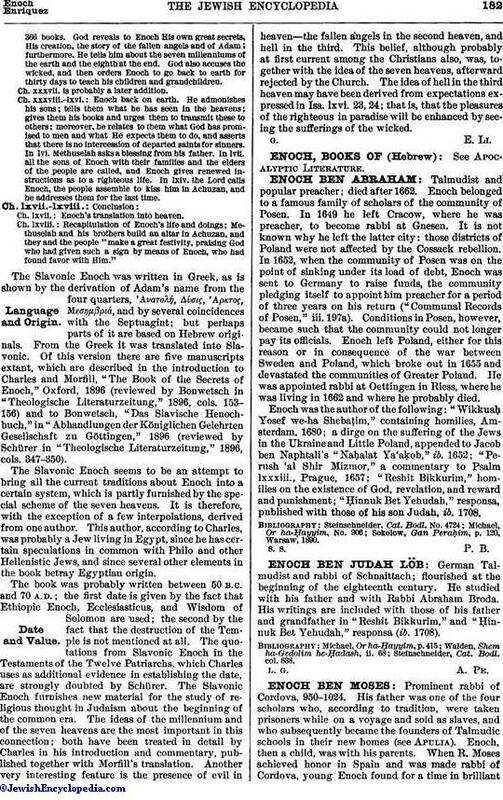 Enoch belonged to a famous family of scholars of the community of Posen. In 1649 he left Cracow, where he was preacher, to become rabbi at Gnesen. It is not known why he left the latter city: those districts of Poland were not affected by the Cossack rebellion. In 1652, when the community of Posen was on the point of sinking under its load of debt, Enoch was sent to Germany to raise funds, the community pledging itself to appoint him preacher for a period of three years on his return ("Communal Records of Posen," iii. 197a). Conditions in Posen, however, became such that the community could not longer pay its officials. Enoch left Poland, either for this reason or in consequence of the war between Sweden and Poland, which broke out in 1655 and devastated the communities of Greater Poland. He was appointed rabbi at Oettingen in Riess, where he was living in 1662 and where he probably died. Enoch was the author of the following: "Wikkuaḥ Yosef we-ha Shebaṭim," containing homilies, Amsterdam, 1680; a dirge on the suffering of the Jews in the Ukraine and Little Poland, appended to Jacob ben Naphtali's "Naḥalat Ya'aḳob," ib. 1652; "Perush 'al Shir Mizmor," a commentary to Psalm lxxxiii., Prague, 1657; "Reshit Bikkurim," homilies on the existence of God, revelation, and reward and punishment; "Ḥinnuk Bet Yehudah," responsa, published with those of his son Judah, ib. 1708. Sokolow, Gan Peraḥim, p. 120, Warsaw, 1890.